There's lots of things your dog is really great at, and we're really happy that he's so great. We're happy that he's your best friend, that he's undyingly cute, and that he's a valued member of your family. But, there is one area where we've identified your canine friend as being just a little bit of underachiever: at Gettin' 'dino with it! Sure, he's real good at hiding and chewing bones, and he loves chasing his own tail. But he has zero spikes. Zero ability to time warp back in time to the Age of the Dinosaur. And zero ability to go toe to toe with those massive Jurassic beasts in one showdown to find out who rules all. Now, we'd love to offer you all of those amazing traits with one deft product purchase, but unfortunately there's not much that can be done to dramatically change his situation in one fell swoop. We can, however, offer you one thing that's going to be a dramatic improvement—this Stegosaurus dog costume! It's soft, plush, and will give your pet some serious spikes. We can't say as to whether or not he'll love wearing it, but we are sure he'll get a serious boost in confidence from wearing it to the big pup costume party. 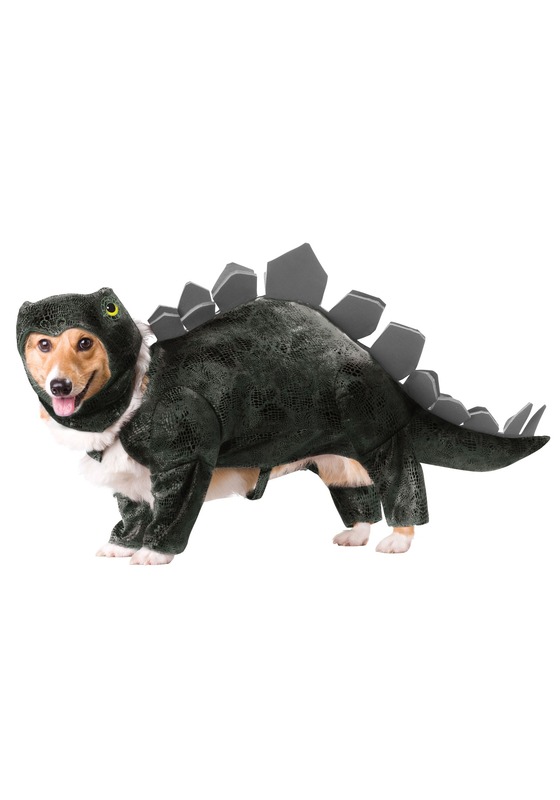 First step, take over the canine kingdom, next step, rule all of dinosaur kind!